The Great Hall in the Massachusetts Statehouse, featuring town flags. A photograph of Williamsburg, Massachusetts' town flag that will be displayed in Boston in the Great Hall. The multi-year process culminates with the raising of the flag on Wednesday for the town, which was incorporated in 1771. The town's flag committee created a draft of the design, which was then painted by an artist. 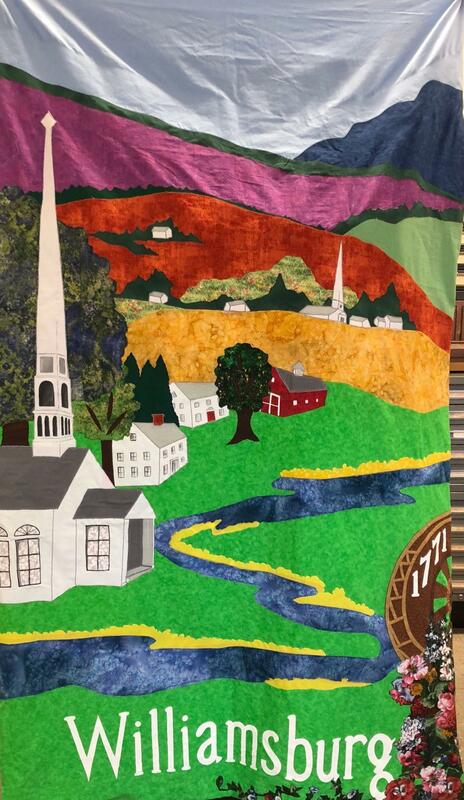 Town administrator Charlene Nardi said the painting was then "converted" into a fabric pattern, and sewn by volunteers. A Williamsburg, Massachusetts town flag will be displayed in Boston in the Great Hall. It shows the year of the town's incorporation in 1771. "They started it back in the late spring, I think, and they've just completed it a week ago," Nardi said. "We've created so many friendships in just putting the fabric together to show the history of Williamsburg. We've all come together, and all of our different skills, and put them in this flag." State Representative Steve Kulik said most of his district's towns already have flags on display. "It's a really attractive feature for visitors to the Statehouse to try to find their community's flag," Kulik said. Kulik said town flags have only been hanging in the Great Hall for a couple decades. He said one of the original reasons was to deaden the acoustics in the large room. Correction: An earlier version of this post incorrectly stated the date of Williamsburg's incorporation.